Can Aluminum Be Used for Wire Wrapped Jewelry? Not too long ago, a reader named Vivian emailed me. She asked, "I make jewelry and want to do some wire wrapping using aluminum wire. I know how to work with copper but aluminum is new for me. Where can I buy this aluminum wire? Is there a specific one for jewelry? Will the finished pieces last long? Will they tarnish?" Aluminum is a very cost effective alternative to sterling silver or silver plated wire. But do be careful with it as it is more brittle than other types of metals. It will break if you overwork it. It is also a soft metal so you could mar it with tools if you are not cautious. I haven't really encountered the finer gauges of aluminum for wire wrapping though. I typically use 20G and thicker. If you wish to wire wrap, you will need to switch to 26G or 28G colored copper or silver for wrapping. 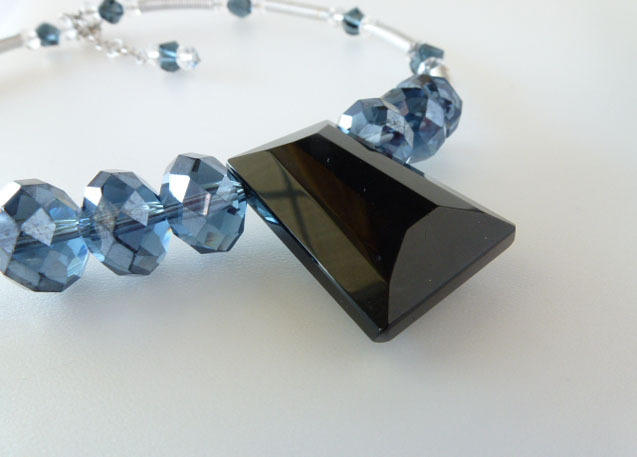 Shown above is my Midnight Blue coiled wire and crystal necklace. I coiled with 20 G bright aluminum. I like to use bright aluminum which is shinier than the regular kind. It is cleaner to work with. If you buy aluminum from the hardware store, it may be "dirty" - black stuff rubs off it. It's not as durable as some of the other metals and certainly does not have the same appeal as with the precious metals like sterling silver. One advantage though is its lightness so big design pieces are possible without excess weight. However, also bear in mind some people prefer heftier jewelry. The good news is aluminum doesn't tarnish like sterling silver but it does become dull with time. Also be careful about tumbling bright aluminum with stainless steel shot as that shininess disappears and you are left with something matte! Here is the solution if this happens. Tumble only with dry rice or ground walnut shells. Vivian had a lot of questions regarding aluminum wire and they were all very good questions. I've been tempted but have not yet purchased aluminum wire, its affordable price though is rather seductive. I too have had customers that like the feel of heftier pieces, guess it is a personal preference. I would really like to try using this wire in earring designs where weight tends to be an issue, not many ladies want to have their earlobes hanging down to their shoulders . . . other than those who wear ear expanders. Thanks Pearl for answering Vivian's inquires as they were questions that had gone through my mind also. I have used aluminum wire in some of my designs, since sterling is so expensive. It is a really soft metal. It comes out really pretty when tumbled, but I didn't know that over time it becomes matte. That's good to know. Next time I will tumble with rice. I learned about not tumbling with stainless steel shot the hard way! Nothing worse than seeing bright aluminum turn matte! I started out using stainless and then moved to Al before I became confident enough to invest in the precious metals. I really enjoy the bright Al and its lightness but have never had a problem with softness! I only have 18 gauge for making links and bigger pieces, so maybe a smaller gauge would be easier to wrap, but I find the Al incredibly springy. It never wants to stay as tightly wound as I want it unless it is anchored. I've had very little trouble with tarnish in the past 4ish years of using Al, so I haven't had to try cleaning any of it!